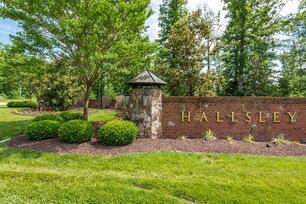 Hallsley, located in Chesterfield County, offers luxury amenities that are unparalleled by any other community. The Residents Club offers amenities for the whole family to enjoy, as well as a year-round calendar of events. The Clubhouse itself features an outdoor Cabana bar, as well as covered decks and porches that provide numerous areas for entertainment. Hallsley has received countless awards, including being named the 2017 Best Master Planned Community by the National Association of Home Builders. Are you looking for homes for sale in Hallsley? 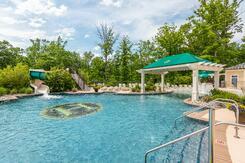 You can live the resort lifestyle in your own backyard! Hallsley’s community pool is unmatched due to its beach-like zero entry, waterslide, waterspouts, lap lanes, and adult area. Hallsey also has their own community swim team, named the The Hallsley High Tides! Hallsley features outdoor recreation opportunities for all age groups and members of the family. Not only are there activities at the Clubhouse like Bocce Ball and Pickle Ball, but the high-end tennis and volleyball courts provide a space for athletic development and friendly competition. For the children, there is a spectacular treehouse playground that allows them to use their imagination and spend time outdoors, as well a zipline that provides them adventure and the opportunity to try new activities. Central Virigina’s moderate climate allows many of the Hallsley amenities to be accessible for most of the year. Family and friends living in Hallsley can socialize and fish at the stocked catch-and-release fishing pond, or run, walk, or bike on the miles of trails through the community. Hallsley also provides amenities for the furry, four-legged members of the family! Central Bark dog park is a well-maintained and secure place to bring dogs to socialize and burn off energy. Hallsley has numerous parks spread throughout the community so no matter where you live, nature is close by. Are you looking for homes for sale in Hallsley? Living in Hallsley is an experience unmatched by any other community! For more information, click here to download our Hallsley neighborhood guide.